So I’m pitting two of my favoured online games apparel retailers against each other in Three Rounds. I’m not going to review specific items of clothing but I will give some opinions at the end. 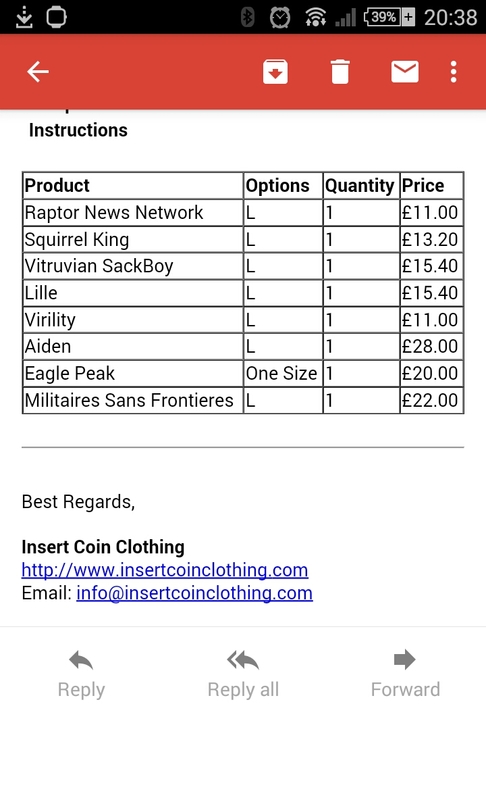 Insert Coin‘s website was very easy to use on my mobile phone maybe a little too easy, due to the formatting of the site. Navigating to items was simple, images of products look clear, professionally taken and from various angles and zoomed brilliantly on mobile. I experienced no issues signing up and logging in and checking order status etc. Musterbrand‘s website was easy to navigate via mobile but major issues with Chrome on mobile, not allowing me to see where the log in area is. Resulting in me switching to the Tablet, as it had greater screen real estate. The site was well laid out, with easy navigation of styles and collections. The basket worked really well allowing for a preview of what it contained, with an easy option to remove unwanted items. Musterbrand have a very varied collection of items from T-shirts, Shirts, Jackets, Jumpers, Hoodies, Coats, Jeans, shorts, combats and accessories. Covering major franchises such as Assassin’s Creed, Witcher, Metal Gear Solid, Hitman, Deus Ex, Streetfighter X Tekken, Resident Evil, Portal. Insert Coin cater well for both sexes there’s a massive collection of T-shirts and hoodies, with a small selection of shirts and other accessories (i.e. bags, hats, gloves, scarves and dressing gowns). Covering many favourite franchises some modern like inFamous Second Son, Killzone, LBP, DmC, The Last of Us, Metal Gear Solid, Resident Evil, Assassin’s Creed, God of War. And more classic like Pa Rappa the Rapper, Street Fighter, Sonic, Mega Man. 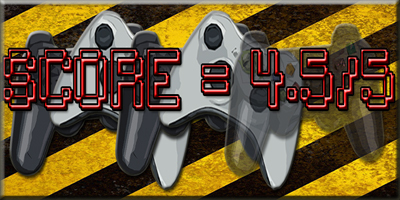 Very PlayStation-centric, which isn’t a bad thing in my opinion. With none sale items prices reasonable on Insert Coin, with Tee’s tend to be around £22 each but often have 3 for 2 Offers which brings it down to £16 each. 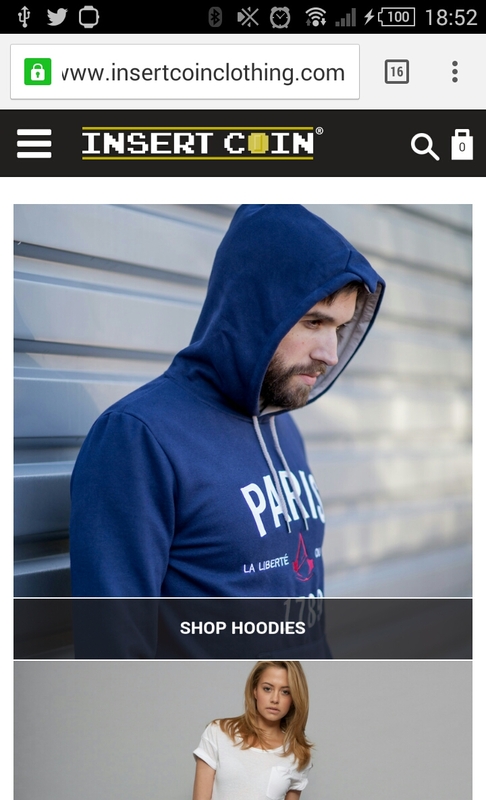 Hoodies range from £40-50 each but can be picked up cheaper during sales. The sales are were real bargains can be picked up with Tees from £6.60, Hoodies from £20. They also do bundles deals for specific games, which brings savings too. Where as Musterbrand have Tees starting at £15 & long sleeve tees £26, Shirts from £42, Hoodies from £44, Trousers from £53.10, Jackets / Coats £69 / £159. The sales bring prices down to from £9 for tees, Hoodies for £22, Shirts £21, Jackets from £44. Insert Coin have a couple of powerful punches given that they do all of the things that Musterbrand do but a quick Googling netted me a 15% discount code. They also have a loyalty system where you can earn Coins for discounts of future purchases. Even with discount code but only on pound for pound spent (excluding cost of postage) [Thanks Dan from Insert Coin for clarification via email]. 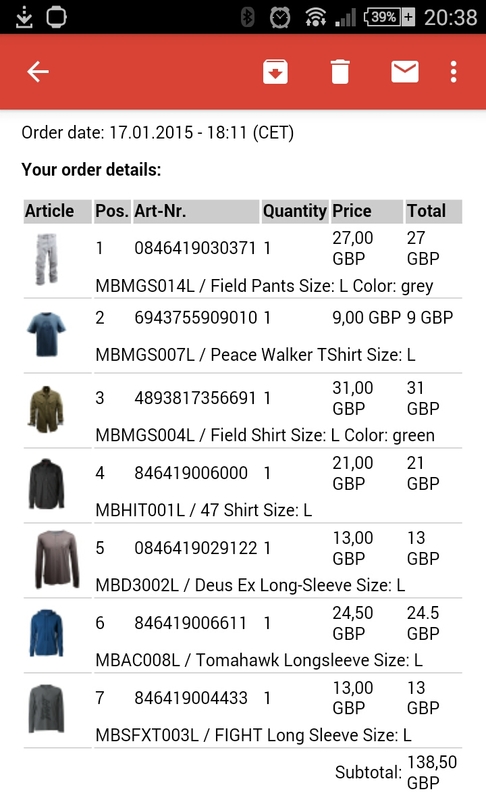 Musterbrand sent me an Order Confirmation Email at 17:11 on 17/1/15 and was shipped at 14:50 on 19/1/15. Costing me £5 and traveling from Germany via tracked UPS delivery, giving an expected delivery date of 22/1/15 by the end of the day. I was alerted to the fact my delivery was going to be delayed (by a day) due to adverse weathe. Arriving at 9:25 on 23/1/15, not long after signing I received an email from UPS confirming my order had been delivery. Sadly Insert Coins notification and delivery doesn’t fair so well as I ordered on 16/1/15 at 22:47 and was shipped from Essex (UK) via Royal Mail 24/48. Delivery at 15:24 on 20/1/15. With no real ability to track the package or an expected delivery time. It was received on 22/1/15 at 10:09 and signed for my by partner as I was at work. I did get an email through confirming receipt before my girlfriend had chance to text me that it had been received. 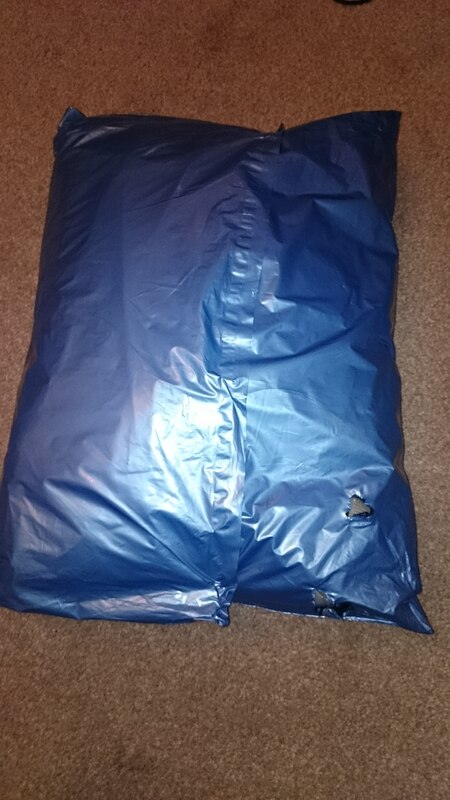 My Insert Coin order was delivered in a slightly damaged blue plastic delivery bag, all the items were minimally packaged in clear plastic packets. Having previously only received Hoodies from them as presents I was unsure if the quality would match the hoodies. With the Tees being 100% Cotton made in China, are of a good thickness, the color of the fabric is vibrant and striking, the printing is fantastically sharp. The Assassin’s Creed 3 Dressing gown wasn’t as soft as I was expecting but the peaked hood and embroidered detailing is fabulous and a lovely match to my Connor Hoodie. The Watch_Dogs jumper has a higher poly-wool blend than I expected but it is a great fit and unique thumb holes in the sleeves are a clever touch, excellent subtle embroidered WD logo. The zip feels a bit sticky but I’m sure that will loosen with use. The Metal Gear Solid long sleeve is a little odd as it has lycra 2/3 length sleeves which I wasn’t expecting but the logo and black white combo is striking. My only issue is that everything was ordered in large as my two medium Assassin’s Creed hoodies are now starting to feel a little snug, and the God of War Kratos hoodie I received for Xmas is a great fit in large. Two of the tees Raptor News Network and Sackboy feel more like a medium, after discussing with Insert Coin on twitter its due to them being older styles, but the Sackboy I could barely get my head through the neck hole. I’m going to return & request larger XL size. 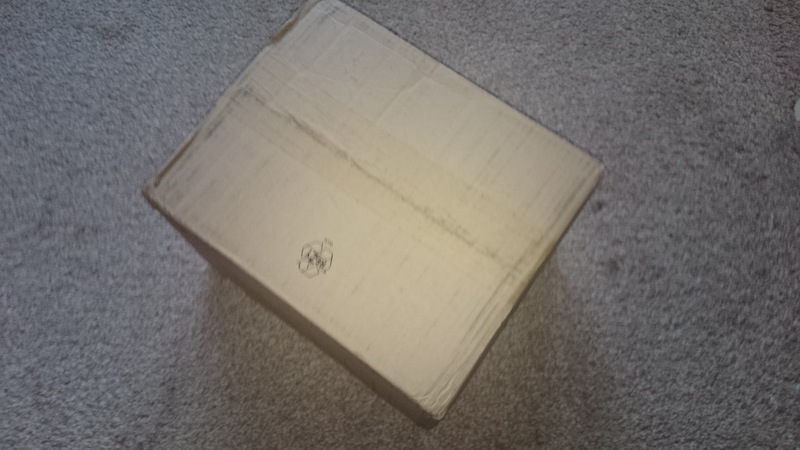 Musterbrand delivery came in a reasonable sized cardboard box, with varying levels of packaging around each product. The Metal Gear Solid Peace Walker Field Shirt has tissue paper protecting the buttons, the Hitman shirt was packaged like a proper formal shirt with cardboard inserts, tissue paper and plastic shirt grips. The rest were in plastic packages, like Insert Coin but without a signature logo, just a barcode an item details. All the long sleeve tees are of an incredible high quality and perfect fit being 100% Cotton produced in India, China or Pakistan but feel like they have a some elasticity. The printing and buttons are lovely, really subtle and don’t screams gaming geek wear. This majorly applies to the Hitman shirt which is easily of a superior quality to some designer brands. The fit is incredible due to it being mixed with Elastin and the subtle 47 on the bottom corner and raised bar code on the pocket means you could easily wear this to formal occasions without looking out of place. Having received a Peace Walker field Shirt & combats for my birthday I knew what to expect, with a dense and baggy but comfortable cotton fit. The pop on/off rubberised logo is exceptionally well designed. The shirt allows for rolling up the sleeves with straps to keep them up. My only issue is the shirt cuffs feel like they’re on the wrong way round but you quickly adjust and the combats are really long in the leg but can be easily turned up. 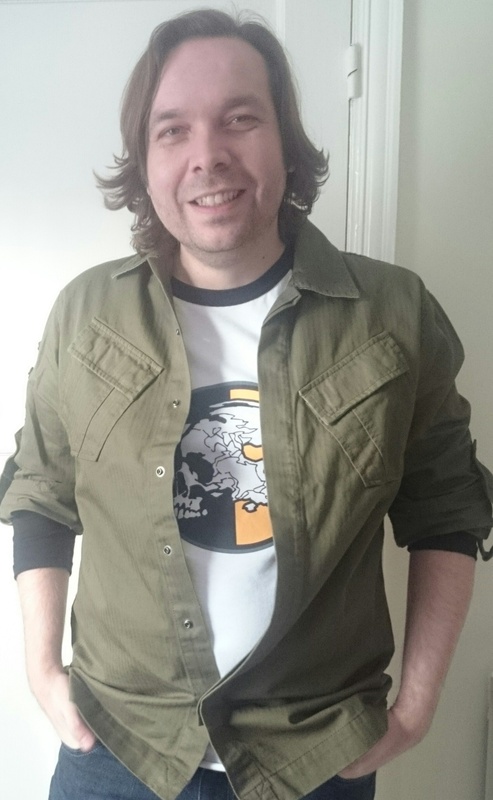 The Peace Walker tee is a beautiful colour and a perfect complement to the other Metal Gear items. This is a fairly subjective opinion but I feel it’s really good after 4 years my Ezio hoodie from Insert Coin is still going strong with the embroidered writing still a vibrant red, a slight bit of pilling but nothing disastrous. I’m expecting the Tees will last the same if I adhere to washing & ironing instructions. The prices of the items is easily on a par or better than most high street retailers who don’t generally stock gaming wear. But the prices during sales are amazing value, I’d challenge anyone to find such great quality at these prices. 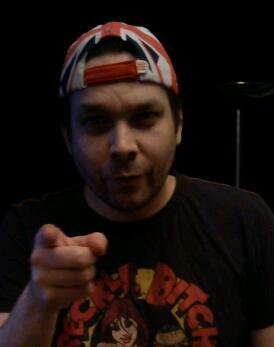 Me wearing the DmC Raptor News Network Tee Note how tight the fit is. Musterbrand‘s prices can be fairly high but are still lower than designer brands, with a quality and attention to detail that easily matches or betters big high street designers. The unique nature makes them feel bespoke and I’ve no argument over the longevity of my Peace Walker combats and shirt, which have been well worn over three years and still look and feel fabulous. Given the bargains available in the sale I had to begrudgingly remove some items from my basket or I’d have spent way more than I should. Supporting Insert Coin as a British based retailer for me is really important and this level of quality and value deserves your money. With a rewards program that means you build up discount for future purchases. With an active a friendly presence on social media, you’re never far from getting advice and help. Regular sales, offers and discounts are a great incentive for making many repeat purchases, from a range that is regularly updated and changing its great to see what else they add. I do have a couple of negatives, personally I’d like to see some shorts or trousers for men, maybe some pants and socks too but I know other retailers cover these. Also sizing appears to be an issue, as the standardisation mentioned on the site isn’t always accurate but a friendly and easy [free in UK] returns policy is a great way to exchange items. 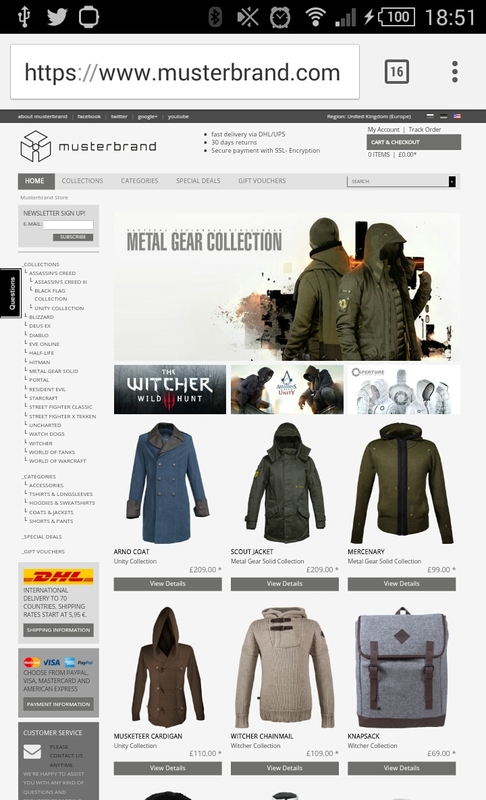 With Musterbrand based in Germany, this company appears to be catering for the more cash rich gamer with products of a higher price but the value is really there. Given some of the bargains I picked up in the sale, I kinda of feel I’ve ripped them off. The attention to detail, quality and of the products is easily on par with more expensive designers that you’d find in high street concessions. The range is fantastic and has new lines being added, but it appears the trousers and shorts may sadly be being phased out which is a shame as they’re really nice. The coats are expensive but my god do they look good. Not having to return anything I can’t comment on the returns policy but they’re social media presence is not as strong as I feel it should be and their website had issues with my mobile Chrome browser. That said everything came quickly and fitted perfectly, it’s just a shame they don’t offer a loyalty / rewards system or any bundle deals. I’m kicking myself for missing out on the Abstergo & Assassin’s Creed polo shirts but received the excellent Kratos hoodie (seen in the banner pic) for xmas. My most desired items have to be the inFAMOUS Karma hoodie and Conduit denim Cut. Which would make great use of the Insert Coin made Delsin beanie and badges that came with my inFamous Second Son Collectors Edition, I’d better get saving. After checking my Coin balance I have accrued 97 Coins so far, netting me a saving currently of £9.70. For me I was gutted they were out of the Uncharted long sleeve top & Uncharted Tee in my size but there are two coats that I love. The Assassin’s Creed: Unity Arno Coat and Metal Gear Solid Scout Jacket, hopefully I’ll have saved enough during the year to have purchased one or both. Thanks for reading and apologies for my poor quality pictures. Screen grabs taken using mobile phone and Chrome Browser. All products were purchased with my own money, for my own personal taste. http://www.JoypadAndMe.com is not being paid to advertise these sites. The opinion is purely my own, please read all terms and conditions before purchasing from either site as conditions may apply. Please feel free to let me know if I’ve tempted you into buying anything from either retailer and what you picked up.